Reading is something that I’ve done for as long as I can remember. 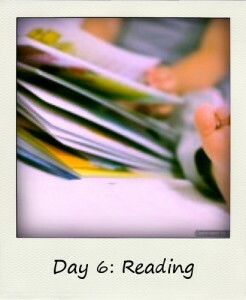 I learned to read before I started school and I’ve never stopped loving it. I had a great example in that my mom read often. When I was a child she knitted a lot, but she read even more often. We would sometimes just sit together in the living room, each reading our own books. Or we would sit on my parents’ bed reading our books while Daddy watched TV in the living room. I hope I’ve set as good an example for my kids. I think we may be okay. The older one checks out 20 books every time we go the library and the little one cries if we drive by the library without stopping.